Persona 4 is a decade old, and it still has a lot to celebrate. Happy 10th anniversary to Persona 4! On this day in 2008, the fourth entry in the popular Shin Megami Tensei spin-off series hit the PlayStation 2, and fans were immediately presented with a vital question: Who is the best girl? Let me answer that one in order of best to least-best (since all the girls are lovely, in my book): Yukiko, Naoto, Chie, and Rise. Not that Persona 4 is strictly about flirting and dating and cheering on Kanji as he knits adorable little dolls, of course. The game's events center around a series of grisly murders occurring in a sleepy little town and have to get to the bottom of things with the help of your pals. It's all very serious and important until your drunken homeroom teacher vomits into the creek you're swimming in. He's still warmer than my grade 10 science teacher. Though 2006's Persona 3 garnered considerable Western attention, Persona 4's lively cast and stellar localization helped the series take a large step towards our mainstream culture—a journey it completed when 2017's Persona 5 became a million-seller. Persona 4 is very much Scooby-Doo meets Buffy the Vampire Slayer, and it leans heavily into the themes of camaraderie both series offer. The protagonists of Persona 4 are a close-knit group, and their primary concern is solving the murder mystery plaguing their town. By contrast, Persona 5—and most Shin Megami games in general—throws the player into big problems with world-encompassing consequences early on. It's weird to call Persona 4 a "cozy" game, but when I think back on my playthrough, I remember the good times I had hanging with Persona 4's affable cast more clearly than I remember fighting the demons seething in the TV World. My friends and I went camping, we ate terrible curry, and we trod the same road in the Japanese countryside day after day on our way to and from school. Yeah, bodies occasionally wound up hanging from TV antennae and my pals were forced to confront and accept the darkest corners of their psyche, but gosh, we had a good time! All that fun romping around even encouraged fans to produce some incredible tributes, like cartoonist Gigi D.G. 's irresistibly quotable Persona 4 comic parody ("Fsteak?"). 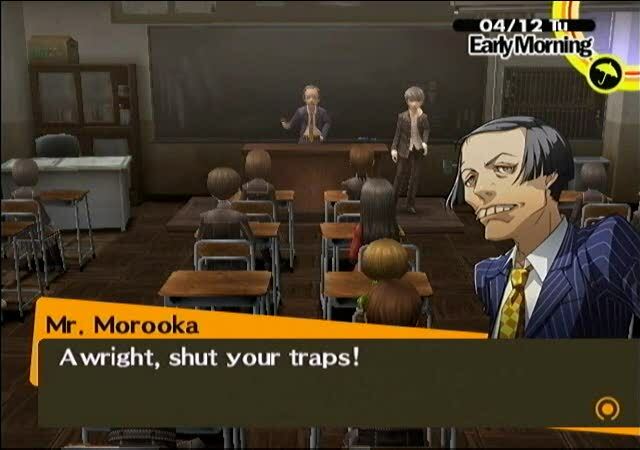 If it's not obvious, reminiscing about Persona 4 is a bit like recalling "the good old days" as a Baby Boomer. It's easy to remember all the good things about the game while hand-waving its more troubling aspects, e.g. its disappointingly juvenile methods of exploring complicated questions about gender and sexuality. Less troubling but still worth mentioning are its rather straightforward dungeons: I find Persona 5's themed dungeons far more interesting to work through. Despite those bumps, we voted Persona 4 one of our 15 Best RPG Since 2000. I also played through 2012's Persona 4 The Golden on PS Vita for the Axe of the Blood God podcast, and Kat and I spent a lot of time discussing the game scenario by scenario. You should have a listen if you're any kind of Persona 4 fan. Speaking of Persona 4 The Golden (which was my first foray into the Persona series), I had to exclude Marie from my opening list of best girls because she was an addition to the "upgraded" version of the game. I'll just say it here: Marie is the best Persona girl, period. You might disagree, but I have a mountain of angry goth poetry that indicates otherwise. Tagged with Analyses,	Atlus,	PlayStation 2.